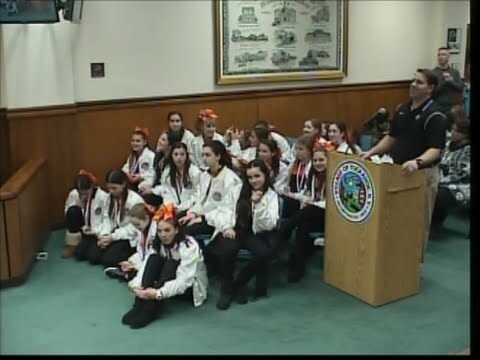 TUCKAHOE, N.Y. - The Tuckahoe Tiger cheerleading squad was once again in the spotlight this week, as local officials heaped praise on what is believed to be the village’s first national championship team in any sport. In just their second year competing in at Walt Disney World at the National High School Cheerleading Championship in Florida, the Tigers shook off last year’s fifth place finish - earning top honors amongst the nation’s top 20 teams en route to a gold medal in the Senior Rec Division in Orlando. With a routine described as “flawless,” by coach David Anthony Pope, the Tigers didn’t stop there, with their performance earning them a silver medal versus visiting nations from around the world, losing only to a team they had beaten in the national title championship. Donning their victory white jackets for the national title, the Tuckahoe Tigers cheerleaders did a short impromptu cheer for a capacity crowd at Village Hall before being awarded certificates from Sen. George Latimer’s office by Eastchester Councilman Luigi Marcoccia, who was representing an under-the-weather Town Supervisor Anthony Colavita.